In Podcast #236 I answered four listener questions. Below you will find the audio of all four questions and the transcript for question #1. Please bear in mind that I speak in a slightly more informal fashion than I write, which you will notice in the transcript below. The transcript has been edited slightly for clarity. If you have a question you would like answered in a future podcast please let me know. Question: When you’re doing your tap-along audios you say the words “in big and small” ways a lot. I never really connected with these phrases. Could you expand on why you use those phrases? There’s a specific reason why I use those phrases. Our subconscious mind is very good at making the things we experience in the world into all or nothing propositions. The reason it does this is because every single time we have to think a new thought, it costs us energy. Thinking is one of the most energy intensive things that we do in our bodies. That’s the reason why if you ever go to a training course and you’re learning new things all day, at the end of the day you just feel like you’ve been flattened and wiped out energetically, even though the only thing you’ve done is just sat there and listened and taken notes. Because you’re thinking so hard it is very energy intensive. As we navigate our day, the reason we have habits is so we don’t have to think. A number of studies have been done where they have taken nodes and stuck them right into the middle of the brains of rats as they are learning a maze and making the maze a habit. Once it becomes a habit, it takes very little energy for them to navigate the maze because they’re simply responding to the habit they have developed. Where that shows up in the rest of our life is it makes things into all or nothing propositions because we don’t have to think. If everything is good or everything is bad about something, then there’s no nuance, there’s no subtlety. The instant we bring subtlety into play, it’s a bad idea…except in this situation…because of these extenuating circumstances…it’s actually a good idea. That takes a lot of capacity. Don’t get me wrong, that’s what I think we should be doing. I think we should be thoughtful as we navigate this. 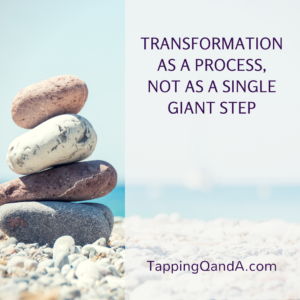 When we’re talking about transformation and we’re tapping on the phrase “I allow myself to change this in big and small ways”, what I’m doing for myself – and this might not resonate with you and might not work with you – is I’m communicating with myself that this transformation doesn’t have to be an all or nothing proposition. Often really small changes add up into amazing things in my life…when a small change is multiplied by every moment of my day, or every moment of my week, or every moment of my life. When I use that phrase “in big and small ways” I’m encouraging my system to remember that is how transformation can happen and it doesn’t have to be an all or nothing proposition. And I found for myself it allows change to happen more quickly because it’s opening my system to incremental change and not making the transformation all at once. Thaks a lot Gene! I’m one of those that prefer to read….I always love your explanations.